Planning a family vacation to sunny San Diego? We’ve got trip ideas for every type of crew! San Diego, the beloved SoCal beach city, is full of awesomeness in quite a few ways: There’s that famous weather (lots of sun and never too cold nor too hot); the laid-back, friendly vibe; the Cali-Baja (read: fresh and yummy) food; and a wealth of family-fun options. In fact, it's a vacation destination with so much to offer for any type of family, a challenge can be how to choose what do without missing the one thing that will make a lifelong memory. 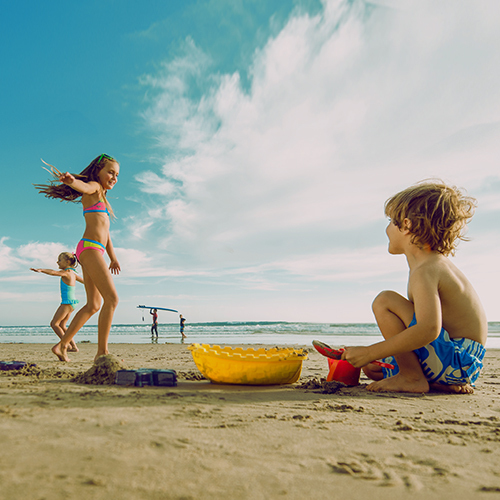 Here, we’ve perfectly plotted-out some kid-tastic plans for all different types of families, to help yours have the best San Diego vacation ever. Your critter-craving crew has come to the right place. The San Diego Zoo, with 4,000 residents—including animals that are hard to find in other U.S. zoos, such as koalas and pandas—is the mother of them all. Just in time for the Zoo’s centennial, Africa Rocks, an eight-acre complex, is opening. It will show off species that inhabit the incredibly wide range on habitats on the continent, including rock hyrax and klipspringers, as well as, for the first time since the 1970s, African penguins. The San Diego Zoo Safari Park, in nearby Escondido, is nearly as populated, with 3,500 exotic beasties roaming natural habitats, including giraffes, rhinos, antelope, and cheetahs. For a splashier adventure, visit SeaWorld San Diego. The classic attraction is a perfect mix of kid-wowing entertainment and environmental education. Located at Scripps Institution of Oceanography, the Birch Aquarium encourages interaction with a variety of marine animals, such as hermit crabs, barnacles, and, if you're lucky, a two-spot octopus. Let's face it: interaction is always better than just seeing. Imparting an appreciation of the local marine ecosystem to the next generation is the goal here. The nonprofit Living Coast Discovery Center is set on the Sweetwater March National Wildlife Refuge, and is also known for its up-close encounters with the likes of endangered sea turtles, stingrays, jellyfish, and other natives of the San Diego Bay habitat. While the Cabrillo National Monument, a national park marking the 1542 arrival of Juan Rodriguez Cabrillo, the first European explorer to reach the West Coast, is itself on many tourists' to-do lists, the adjacent tide pools are less likely to appear—surprising, since anemones and octopi are just a few of the kid-thrilling creatures waiting to be spotted. The Hilton Garden Inn San Diego/Rancho Bernardo is less than 10 miles from the San Diego Zoo Safari Park. This beautiful family hotel has an outdoor pool and kid-friendly, reasonably-priced fare. Fun under the sun, on the sand, and in the surf doesn't get better than this. That's easy: the 70 miles of amazing coastline, most any stretch of which could be the centerpiece of a beach-loving family's trip. Mission Bay is hugely popular with families, while La Jolla Shores, a mile-long sandy stretch adjacent to the San Diego La Jolla Underwater Park Ecological Reserve, is ideal for little ones. It has permanent lifeguard stations and, during the summer months, the waves here are the most preschooler-friendly of all the San Diego beaches. Offered every Saturday, the Silver Strand Beach Jr. Ranger Program in Coronado takes a day at the beach to the next level, with kids ages 7–12 earning California State Parks Junior Ranger Badges. If you’re all ready to relax after scoring those badges, consider settling into a gondola ride. OK, you may not associate gondolas with SoCal, but you may want to start. Gondola rides at the Coronado Cays are a unique water experience for families of up to six. Tide Beach Park at Fletcher Cove, a pretty stretch of sand at the north end of Solana Beach, is a great place for kids to run around and make noise, as kids will. That's because it's rarely crowded, surrounded by steep bluffs. Table Tops, a big reef just off the beach, brings snorkeling and surf-fishing opportunities. You can only get to it by staircase, so leave the stroller in the car. It's easy to find free parking on the surrounding streets. Paradise Point is situated on its own island, offering California-style bungalow accommodations set among lagoons and lush gardens. Are spinning, dipping, and rolling part of the plan? Strap in for the ride of your life. LEGOLAND® California Resort is pretty unusual by theme-park standards: it appeals to both preschoolers and tweens (really), is a manageable size with an intuitive layout, and grown-ups are overheard saying "Whoa...cool!" LEGO® NINJAGO® THE RIDE may well be what your kids talk about all the way home, what with vanquishing the Great Devourer with fireballs and lightning and all. No need to choose between the shore and the rides. Belmont Park is an old-timey charmer with thrill rides alongside midway games and plenty of up-to-the-minute attractions, such as FlowRider, a wave-riding attraction for surfing and boogie boarding. Plus, with this amusement park being beachfront, the view of the Pacific from the top of the coaster is hard to beat. Keep the old-fashioned fun going with a spin on the Carousel at Seaport Village, circa 1895. And while you won't find rides here, we say the La Jolla's Legends Gallery's exhibit of the little-known artwork of Dr. Suess belongs in the "makes you dizzy, but in the very best way" category. La Jolla's hometown hero, aka Theodor Geisel, kept most of the stuff here private. The surreal masterworks will take you on a wild ride indeed. The Hyatt Regency Mission Bay Spa & Marina is super convenient if SeaWorld San Diego is in your family’s plans. It’s also a winner for kids who equate vacation with swimming. The gorgeous tropical lagoon pool complex here has three waterslides. A bit of learning, a dollop of culture, and a whole lot of excitement make for the perfect trip. Balboa Park, the country's largest urban cultural park, is home to 17 museums. Among them: the Fleet Science Center and the San Diego Natural History Museum. Day and week-long museum passes are available to save you time and money. Talk about an under-the-radar, yet over-achieving, museum. The Women's Museum of California located at Liberty Station is small, but its fascinating exhibits make it well worth a stop. It's right next to Comickaze, a comic book store that has an area with little tables and chairs and young-kid appropriate comics. The Old Globe, an outdoor theater in the round, often puts on top-notch kids' productions. Check out Chicano Park, with its collection of more than 60 vivid murals, in the artsy Barrio Logan neighborhood. While you're there, try the rolled tacos at Las Cuatro Milpas. Remember: San Diego is close to the border, which equals stellar Mexican eats. The Hilton San Diego Bayfront is in a beautiful waterfront location, with all rooms having views of the bay and the skyline. Plus, the pool area has an uber-fun splash zone for little ones. Grab the kiddos and get ready for an active good time. At 4,000 acres, the Los Peñasquitos Canyon Preserve has it all for nature-phile families. You'll find plenty of flat terrain for easy-going hiking; waterfalls, giant California Oaks; volcanic rock landscapes; a stream occupied by Pacific tree frogs, crayfish and largemouth bass; a freshwater marsh sheltering great blue herons and egrets; mule deer; and, oh, yes, Native American archaeology dating as far back as 7,000 years. Park rangers are available for guided walks if you like. Torrey Pines State Natural Reserve is a top spot for hiking with kids and teens at all levels of experience. Hint: the Torrey Pines Extension, a five-trail island of sorts, surrounded by a residential area, can be less crowded during the high season, but still gives you stellar ocean views. Sign on for a guided kayak tour on Mission Bay for a unique perspective of the coastline. The Family Sunset Paddles are especially popular with pint-size paddlers. Take in a Padres game from the Park at the Park at Petco Park. Situated outside the outfield wall, but within the park property, you can picnic here while kids run around the child-size baseball field. The giant screen broadcasts every bit of the action. The best part is that these tickets cost less than the standard ones. It's so smart for families with wee baseball fans who have trouble sitting down through nine innings. The Town & Country Resort and Convention Center in Mission Valley is convenient to Torrey Pines State Natural Reserve. Grown-ups and kids alike tend to love its quintessential laid-back California vibe and its kid-friendly (yet chic) eateries and pools. Check out more family-sized fun in San Diego.